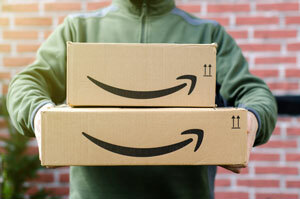 According to a recent survey, Amazon is the primary purchase channel for college students to buy their textbooks, beating out other websites as well as the brick-and-mortar college bookstore. The latest Textbook Cost & Purchasing Study from learning materials publisher FlatWorld surveyed 368 students from two- and four-year institutions across the United States; respondents came from SurveyMonkey Audience, a third-party panel. Fifty-eight percent of survey respondents said they bought at least one textbook on Amazon, compared to 51 percent who shopped in person at their school bookstore. Thirty percent shopped online through another website, and 17 percent shopped on a publisher's website. In particular, students reported that textbook costs at the school bookstore are higher than other places: "School Bookstore typically charges 3x as much as ordering from Amazon or another site," noted one respondent. Overall, students reported spending an average of $396 on textbooks for their spring 2019 semester. About a third (30 percent) said the cost of their textbooks had increased compared to the fall 2018 semester; 28 percent said the cost was about the same. In addition, 42 percent of respondents said they paid extra for access to an online homework system. 40 percent opted not to buy at least one assigned textbook because it was too expensive. Students still seem to prefer print textbooks over digital: While 72 percent reported purchasing more than one of their textbooks in print format, just 40 percent purchased more than one digital textbook. And 30 percent did not buy any digital textbooks. For those students that did go with digital course materials, 65 percent made those purchases individually, as opposed to via a subscription offering. "Many textbook publishers claim that digital-only distribution is the key to bringing textbook costs down. But our study's findings paint a picture of students either turning to used print books instead of purchasing digital copies, or not buying their assigned books at all," commented Alastair Adam, CEO of FlatWorld, in a statement. "When you see just how many students are deciding against buying their assigned readings, as well as how many students are forced to pay extra to complete assigned homework, it's clear that textbook publishers are still falling short when it comes to affordability." A report on the survey results is available on the FlatWorld site.